In a significant advance for the growing field of synthetic biology, Rice University bioengineers have created a toolkit of genes and hardware that uses colored lights and engineered bacteria to bring both mathematical predictability and cut-and-paste simplicity to the world of genetic circuit design. “Life is controlled by DNA-based circuits, and these are similar to the circuits found in electronic devices like smartphones and computers,” said Rice bioengineer Jeffrey Tabor, the lead researcher on the project. 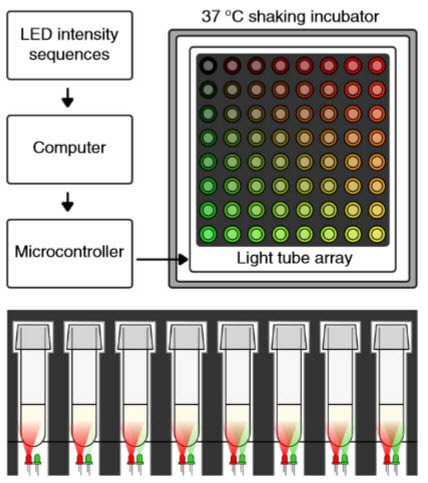 In a paper appearing online in the journal Nature Methods, Tabor and colleagues, including graduate student and lead author Evan Olson, describe a new, ultra high-precision method for creating and measuring gene expression signals in bacteria by combining light-sensing proteins from photosynthetic algae with a simple array of red and green LED lights and standard fluorescent reporter genes. By varying the timing and intensity of the lights, the researchers were able to control exactly when and how much different genes were expressed. “Light provides us a powerful new method for reliably measuring genetic circuit activity,” said Tabor, an assistant professor of bioengineering who also teaches in Rice’s Ph.D. program in systems, synthetic and physical biology. Electronic circuits — like those in computers, smartphones and other devices — are made up of components like transistors, capacitors and diodes that are connected with wires. As information — in the form of voltage — flows through the circuit, the components act upon it. By putting the correct components in the correct order, engineers can build circuits that perform computations and carry out complex information processing. Genetic circuits also process information. Their components are segments of DNA that control whether or not a gene is expressed. Gene expression is the process in which DNA is read and converted to produce a product — such as a protein — that serves a particular purpose in the cell. If a gene is not “expressed,” it is turned off, and its product is not produced. The bacteria used in Tabor’s study have about 4,000 genes, while humans have about 20,000. The processes of life are coordinated by different combinations and timings of genes turning on and off. Each component of a genetic circuit acts on the input it receives — which may be one or more gene-expression products from other components — and produces its own gene-expression product as an output. By linking the right genetic components together, synthetic biologists like Tabor and his students construct genetic circuits that program cells to carry out complex functions, such as counting, having memory, growing into tissues, or diagnosing the signatures of disease in the body. “In electronics, two of the key tools are function generators and oscilloscopes,” said Olson, a graduate student in applied physics. “The function generator sends a known signal into the circuit being characterized. The oscilloscope is a device with a screen that the engineer uses to see the circuit output. By twisting the knobs on the function generator and viewing the corresponding output on the oscilloscope, the engineer can infer what various parts of the circuit are doing. 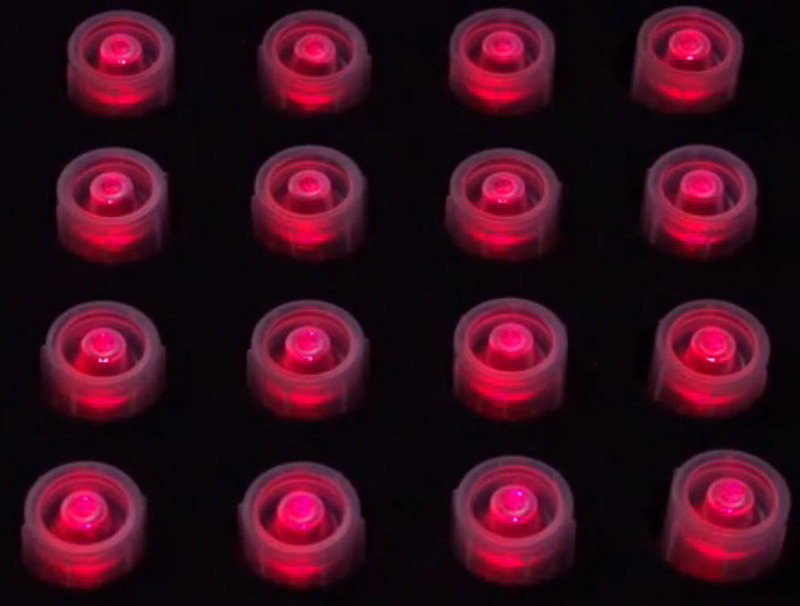 To create a corresponding function generator, Olson, the lead author of the Nature Methods paper, invented the “light tube array,” a programmable, eight-by-eight set of LED lights that will fit under a standard 64-well tray of test tubes. With the addition of some light-blocking foam around each test tube, the team had a way to send individually programmed light signals into each test tube in the array. By varying the signals and measuring the corresponding outputs with their bioscilliscope, the team was able to determine exactly how its test circuit performed. “The precision of light allows us to create exceptionally clean gene expression signals, which we can use to extract far more information about gene circuits than was possible before,” Tabor said. The research was supported by the National Science Foundation, the Office of Naval Research and NASA. Gene circuits are dynamical systems that regulate cellular behaviors, often using protein signals as inputs and outputs. 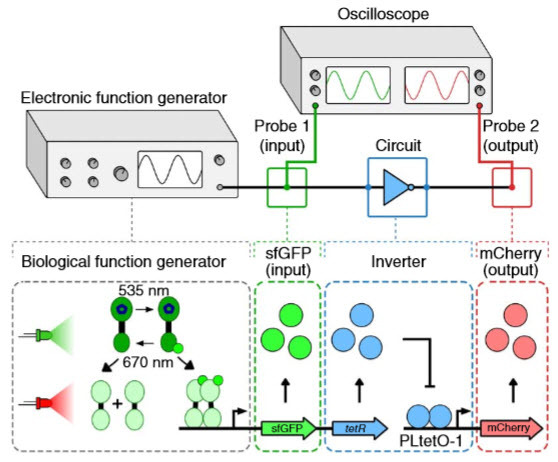 Here we have developed an optogenetic ‘function generator’ method for programming tailor-made gene expression signals in live bacterial cells. We designed precomputed light sequences based on experimentally calibrated mathematical models of light-switchable two-component systems and used them to drive intracellular protein levels to match user-defined reference time courses. We used this approach to generate accelerated and linearized dynamics, sinusoidal oscillations with desired amplitudes and periods, and a complex waveform, all with unprecedented accuracy and precision. We also combined the function generator with a dual fluorescent protein reporter system, analogous to a dual-channel oscilloscope, to reveal that a synthetic repressible promoter linearly transforms repressor signals with an approximate 7-min delay. Our approach will enable a new generation of dynamical analyses of synthetic and natural gene circuits, providing an essential step toward the predictive design and rigorous understanding of biological systems.